Thu., May 3, 2018, 4:28 p.m.
DETROIT – Half a dozen teenage girls from Canada know exactly how to narrow the skills gap. Or at least how to get the process started. The Ontario-based Build a Dream Amazon Warriors were among the thousands of young people from nearly four-dozen countries competing recently for the biggest prize at the FIRST Championship in Detroit. The team members bill themselves as Canada’s only all-female high school robotics team mentored and advised by women. “You know, nerds are the future. 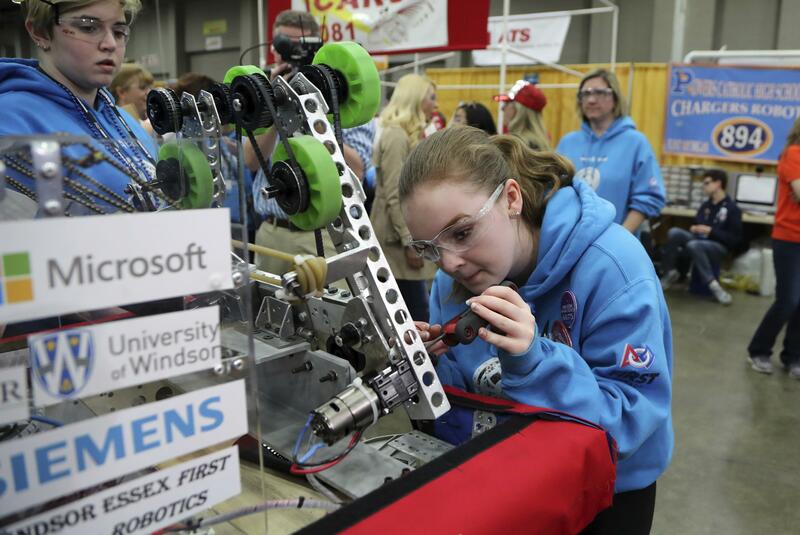 And here, nerds rule,” said Yvonne Pilon, president and CEO of WEtech Alliance, which helped spearhead the growth of FIRST robotics in Windsor, the Canadian city near Detroit. High school teams competed this year in a game called “Power Up,” in which they were tasked with building wheeled robots capable of maneuvering in an enclosed playing arena and picking up and transporting yellow power cubes. Participation has swelled since FIRST’s inception nearly three decades ago, but founder Dean Kamen is still looking for more of those nerds – especially female ones. “I will be totally satisfied when the day comes that the number of girls on teams and the number of boys on teams is randomly, statistically identical,” said Kamen, an inventor who created FIRST – For Inspiration and Recognition of Science and Technology – in 1989. Factories will have a need over the next decade for workers capable of operating and troubleshooting computer-directed machinery, including robots. Many of those future workers are in high school today and, if Kamen has his way, they will join – or start – a robotics team. “This is the only sport you’ll ever play where every kid on every team can turn pro,” he said. Valerie Alexander is one of those kids. The 14-year-old is a member of the Amazon Warriors, who qualified for the FIRST Championship in their rookie year. Canada hasn’t cornered the market on girl power; several U.S. teams that competed in Detroit also featured all-female lineups. One of those, the Fe Maidens (pronounced “Iron Maidens,” playing off the chemical symbol for iron), traveled to Detroit from New York City. “When you walk around the pits, you see a lot of the teams, although they’re co-ed, they’re dominated by boys. And to have a team that’s all girls is something that we’re all very proud of,” said Colin Morrell, the team’s coach and a physics teacher at its school, the Bronx High School of Science. Published: May 3, 2018, 4:28 p.m.